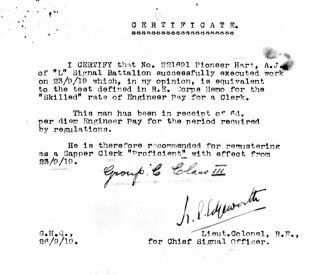 Recommendation of Arthur James Hart for 'remustering'. Arthur James Hart was registered as a Bottesford Absentee Voter, living at Queen Street, Bottesford. His Service Number was 221691 Pioneer, R.E., No.4 Army Wireless Observation Group. He was one of three brothers who all served in WW1. Ewart (Edward) Hart joined the RNVR, and Harry Hart served in the Leicestershire Regiment. Arthur Hart was born in 1889 at Arlesey, Bedfordshire, son of William Hart and Mary Hart, nee Jowett. William Hart was himself born in Arlesey, in 1861, but Mary Jowett was born in Rockley, Nottinghamshire in 1861. They married at East Retford, Nottinghamshire, in June 1882. In 1911, the Harts lived at 2 Market St, Bottesford. William senior was again a signalman. William junior had become a ‘wholesale clerk’, Arthur a ‘national telephone clerk’, and Lucy a domestic servant. Ewart, Alice and two new twins Eva and Percy were all at school, and there was also the youngest, Sydney, still at home. Harry had left home, and was employed as a ‘butcher’s assistant’ at Bulwell, Nottingham. Arthur James Hart married Annie Miler in April, 1914, at Muston Primitive Methodists Chapel. 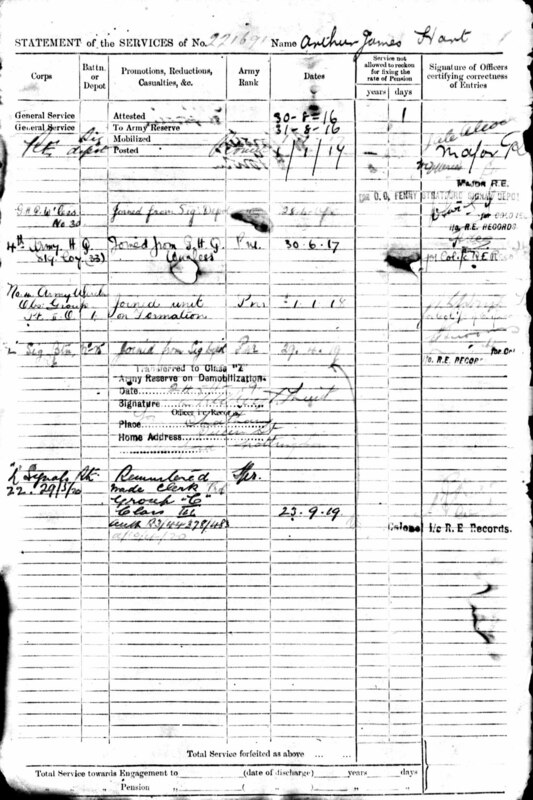 According his service records located online, he Attestated on the 30th August, 1916, as Arthur James Hart, a Post Office Clerk living at 79 Colwick Vale, Nottingham, considered fit for General Service. Later, he stated that his next of kin was his wife, Annie, who lived at Queen Street, Bottesford, and that they had one child “under 16” (the name of the child has not been located). Arthur Clerk spent four months in the Army Reserve before becoming a pioneer in the Royal Engineers, mobilised and posted on the 1st January, 1917. He was required for service in the RE at the Signal Depot, Bletchley, and from there he joined the 4th Army HQ in June, 1917. 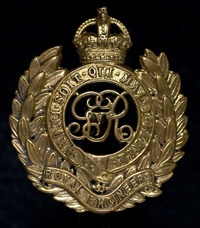 Discussion posted on the Great War Forum explains that Pioneers were men who lacked recognized trades, but were nevertheless admitted into the Royal Engineers because of the shortage of skilled men. They were given training and would receive proficiency papers. 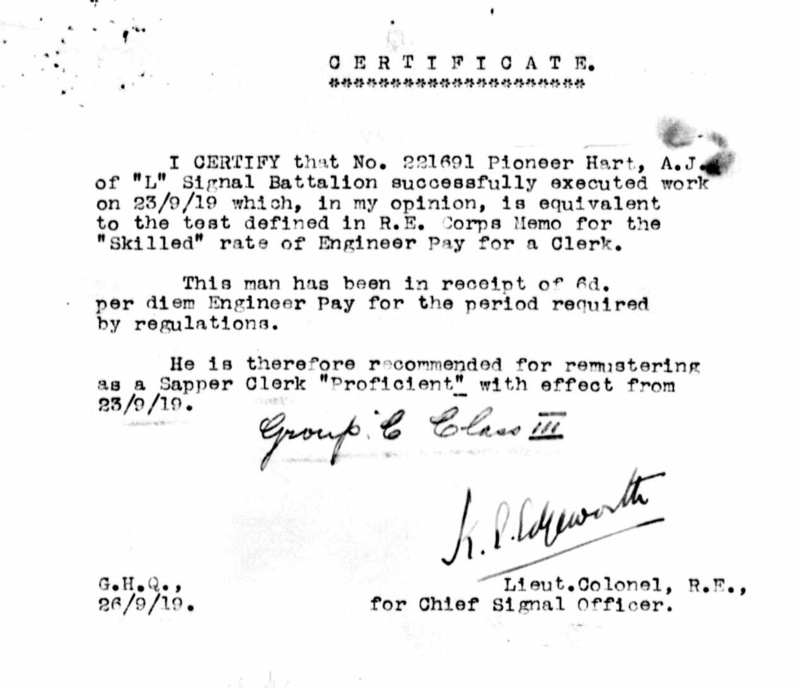 For instance, pre-war telegraphists got proficiency papers in signals, as was the case with Arthur Hart. The rank of Pioneer was abolished in 1919/20. He joined No.4 Army Wireless Observation Group on its formation, and then the Signal Battalion (this predates the creation of the Royal Corps of Signals in 1920). It was officially recognized that he had attained the standard of as a skilled engineer and should be remustered as a Sapper Clerk Proficient, Group C Class III from the 23rd September 1919, presumably with an enhanced rate of pay. He was transferred to the Army Reserve for demobilization on the 24th November, 1919, and presumably discharged from the army not long after. He was awarded the British War Medal and Victory Medal. The Electoral Roll for Bottesford of Autumn, 1923, indicates that Arthur and Annie Hart lived on Chapel Street, as they had during the war years. However, the information is slightly puzzling in that husband and wife are not listed consecutively, which suggests that they may have been residing in different houses. William and Mary Hart (Arthur’s parents) had an address on Queen Street. Arthur’s older brother William Frederick and his wife Alice Mabel lived on High Street. A year later, Arthur and Annie Hart again lived on Chapel Street, and again at different houses, or so it would appear. William and Mary now lived on High Street, as did William Frederick and Alice, while Percy Hart lived on Queen Street. In autumn, 1925, Arthur lived on Chapel Street but Annie was no longer on the Electoral Roll. William senior and Mary are also missing from the roll, while William Frederick and Alice are on the High Street. Thomas and Lily Hart now live on Albert Street. By 1927, there were no Harts on the Bottesford Electoral Roll. The date of Arthur’s death is uncertain. A search of the BMD gave results for eight Arthur James and Arthur J. Hart, any of whom could be the man who lived in Bottesford. His service record and details of his life after the end of WW1 are poorly recorded.